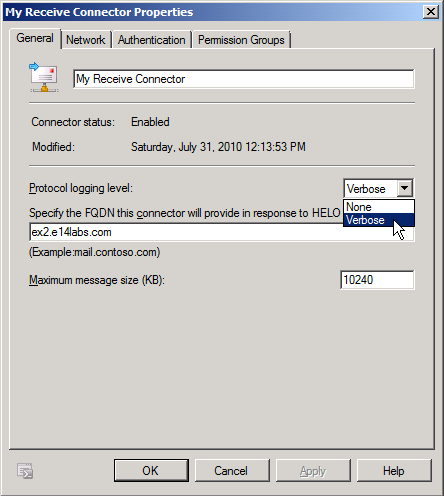 I wrote about logging SMTP protocol activity in Exchange Server 2003 in what is one of the most popular posts on Exchangepedia. Starting with Exchange Server 2007, Exchange discontinued using the SMTP stack in IIS and developed its own SMTP stack. 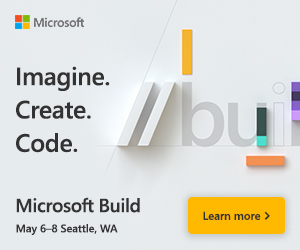 I like to think of it as smarter or more intelligent Receive Connectors (these are protocol listeners, roughly equivalent or comparable to the SMTP Virtual Server we’ve known from Exchange Server 2003/2000). I hoped to see (SMTP) protocol logging turned on by default on SMTP Send Connectors and Receive Connectors in Exchange 2007 and later, but this is one aspect that hasn’t changed. Yes, SMTP logging is still not enabled by default! You have to remember to enable SMTP logging on transport servers. If you’re wondering whether there are any choices for the logging level – there aren’t. It’s either verbose or none. On the General tab, change the Protcol logging level to Verbose, as shown in the screenshot below. On the General tab, change the Protocol logging level to verbose, as shown in the following screenshot. Where do protocol logs reside? Unlike Exchange Server 2003/2000, which maintain separate protocol logs for each SMTP Virtual Server, all Receive Connectors share SMTP receive logs. Similarly, Send Connectors share SMTP send logs. It’s generally a good idea to not locate Exchange data, including Exchange mailbox and public folder databases, transaction logs, and all other logs on the system drive. For more details, see “How to Configure Protocol Logging” in the product documentation. 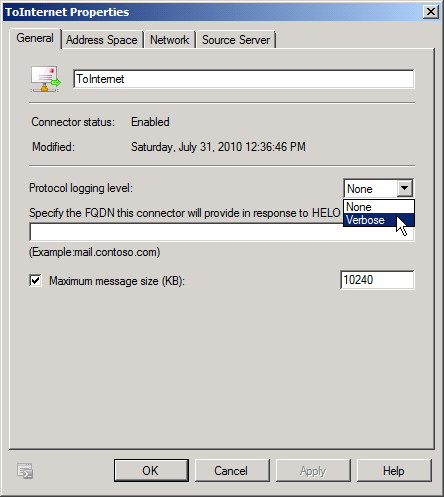 Since SMTP support was provided by IIS, SMTP logging options were also controlled in IIS. IIS did not provide a way to control the disk space occupied by SMTP logs. As a a result, you had to archive or clean up the log directory manually, or automate it using a script. SMTP logging was one of the culprits that contributed to disk volumes on Exchange 2003/2000 servers running out of disk space. ReceiveProtocolLogMaxAge: the maximum age of a receive log. Files older than the specified age are removed. ReceiveProtocolLogMaxDirectorySize: the maximum size of the directory. This ensures the protocol logs for a Receive Connector do not exceed a fixed size. ReceiveProtocolLogMaxFileSize: the maximum size of a single log file. When the active log file reaches this size, it’s rolled over and a new log file created. The default parameters work for most deployments, and ensures you don’t have to worry about purging the logs manually over time, or scheduling a script to do this periodically. You may want to observe the logs created in your environment to determine if these are sufficient, depending on the traffic and number of days worth of logs you want to keep around for troubleshooting. SMTP logs are an important troubleshooting tool – enabling SMTP logging after the fact isn’t any help when troubleshooting SMTP mail flow. Thanks for catching that – it should be -IntraOrgConnectorProtocolLoggingLevel. Corrected. Any way to adjust the recorded time zone like in 2003? @Juan: No, that’s always GMT. Curious if you have to stop/pause any services, such as transport, when changing the log directory. No idea why logging in Exchange is still like 1999… maybe they think it’s to much of a performance impact. Is SMTP AUTH logged when smtp is set to verbose? At least will I see the username used to authenticate? See Protocol logging in Exchange 2013 documentation.